Some polymers can't be dissloved at room temp., or has high viscosity, which is not suitable for electrospinning. TONG LI TECH designed syringe heater for heating the polymer solution up to 80 degree C, it is a simple way to heat the solution. Only syringe can be heated, while the tubing connected with the syringe can't be heated, so it should be used with Tubeless spinneret together. - Can be used for all types of syringes. 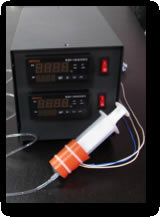 - Two-channel heater：2 syringes can be heated at the same time. - Made from silicon soft sheet.